Sebastian Soderberg claimed his second European Challenge Tour victory by winning the Italian Challenge presented by Cashback World after carding a six under par final round of 65 today. The Swede, pictured with the trophy by courtesy of the European Tour, last won in 2017 at the Barclays Kenya Open and started the final round one shot behind Emilio Cuartero Blanco. However, he carded his third sub-70 round of the week to win by a stroke and become a two-time Challenge Tour champion. The 27 year old started the day with back-to-back birdies to join the early pacesetters at the top. He gained another shot on the sixth hole in reply to his only bogey of the day, as he kept the pressure on the leaders. Ireland’s Ruairdhri McGee was one of them after he shot the low round of the week, eight under par, a round of 63 to set the clubhouse target at 14 under par. 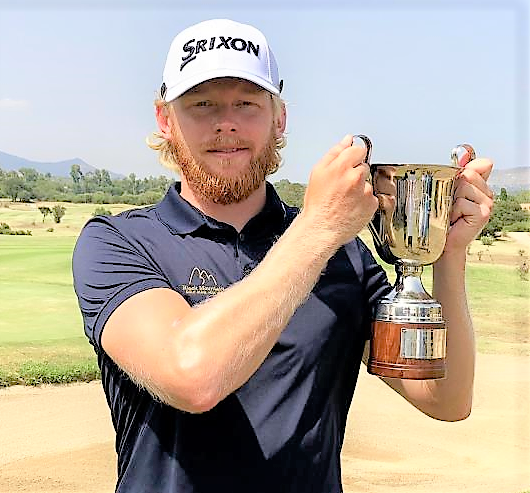 With work to do after the turn, Soderberg called upon his experience as he holed three successive birdie putts to move out in-front in the Sardinian sun. He passed McGee’s early target but Eirik Tage Johansen, who led during the opening round, equalled the low round of the week (63) and finished on 16 under par to tie with Soderberg, who still had three holes to play. The Swede refused to settle for his second runner-up finish of the season as he birdied the 17th and two-putted for par on the final hole to be crowned champion. After an extremely hot week with gruelling conditions on the final day, Soderberg was delighted to come out on top. “I played some nice golf today and it feels amazing to win,” he said. "It was a struggle to focus out there in the heat, which kind of helped, because I was so focussed on eating, drinking and walking with a wet towel. I only thought about what score I was on towards the end because I was so focussed on getting in. “I didn’t look at the leaderboard all day. I was playing well, and I didn’t want to do anything to change that. I figured 16 or 17 under would win it because there were a lot of birdie chances out there. After I holed out on the 17th I took a peak at the leaderboard and knew I needed to par for the win, which felt amazing. “To win on a Sunday and not lose means everything. The final day in Kenya hurt for a while, so that doesn’t matter anymore as this feels great. With the victory Soderberg returns to the top ten on the Road to Ras Al Khaimah to sit third – his highest position this season. Johansen’s runner-up position sees him move from 66th to 14th while Cuartero Blanco leaps 101 places to 37th. Chris Doak had his fourth sub-70 score in succession, a 68 for 11-under-par 273 but so low was the general standard of scores that the Scot finished no higher than joint 13th.